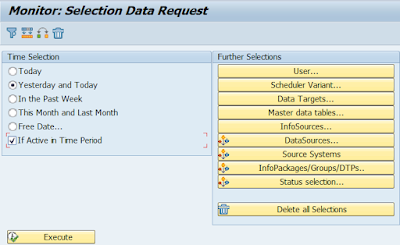 There are couple of user related settings when it comes to Data Load Monitor function of BW’s Administration Workbench (RSA1). They are stored in table RSRADIOMON. In this post I will discuss what are they about and how to set it. FREE Represents flag: If Active in Time Period (if set means requests will be selected for which the system logged a message in the specified period). Free data range is saved in global memory under ID SELECTOPTIONSDATE, no persistent storage. TREEWIDTH Number of pixel for TREE control on the left part of RSA1 (monitor of info packs). Useful to e.g. it in case it is too small and user can’t navigate e.g. can’t be enlarged. CHAIN_TREEWIDTH Number of pixel for TREE control on the left part of RSA1 (monitor and process chain monitor). Useful to e.g. it in case it is too small and user can’t navigate e.g. can’t be enlarged. CHAIN_ACCESSABLE Possibility of showing PC tree displayed in Network view. Normally this is not available for SAP GUI for JAVA. If you need to display your PCs in the Network view set this field to Y manually in the table for your user. Possible values: N or Y. Zero elimination (sometimes called NULL elimination) is process within BW which does deletion of records in fact table where all Key Figure values are zero. This can be normally seen as BW administration task. It can be performed on Manage screen of cubes in RSA1. On tab called COLLAPSE a check box “With Zero Elimination” is available. 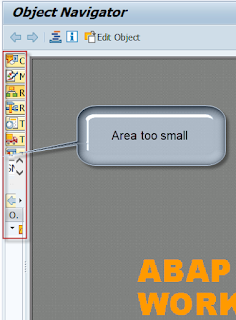 This task can also be done outside from the RSA1 by executing or scheduling a ABAP report RSCDS_NULLELIM. The report calls FM RSCDS_EXEC_NULLELIM for the task execution. 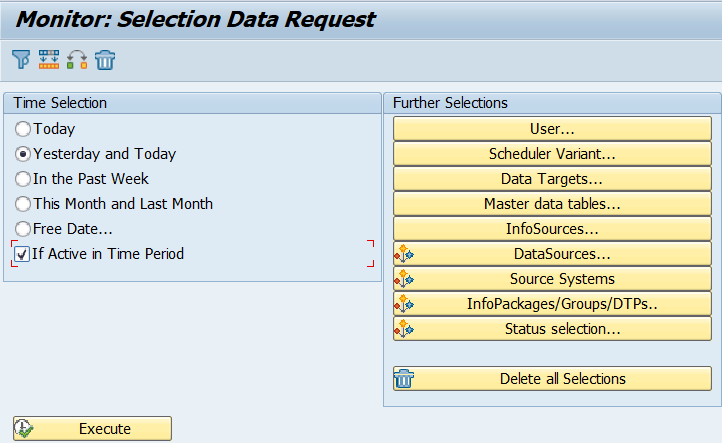 In case the BW system is HANA based there is a report RSHDB_EXECUTE_CLEANUP_NULLELIM for HANA DB. Parameters of program are very well described in this wiki. From technical point of view notice there are few limitations of this functionality. Main one is that there is no 100% zero elimination for the Key Figures of type FLTP. It is not possible to precisely evaluate whether the KF type of FLTP is really equal to zero. Value of the KF may be close to zero but not precisely zero. Therefore, as word of advice in scenarios that rely on exact summing never use the KF type of FLTP. Report is using value 1.0E-50 which is pretty close to zero but there might be a values stored in the BW that are even smaller. Also the NULL elimination is only possible if the KF aggregation is SUM for all of the KF used in the cube. If the cube contains the KF with aggregation types other than SUM (e.g. MIN or MAX) the database cannot eliminate the zero lines during the compression. In one of my last posts I wrote about nodejs RFC Connector provided by SAP to connect SAP backend systems. The Connector works very well. However, while I was setting it up I faced few issues. I’m listing them here with solutions how to overcome them; perhaps it will be useful for someone else too. Basically the node-rfc tries to find rfc.node in specific folder /build/rfc but it's not in there because by default when it is installed another subfolder is placed there. In my case on OS Windows it is the subfolder "win32_x64". Solution is to just move or copy the rfc.node file to one level up. 3. Issues related to path variable.